My latest installment in the periodic Latin American restaurants in Charlotte series, which has picked up recently because it's summer so my schedule is much more relaxed. It's my small effort to highlight good food along with the importance of immigrants and their hard work. They are not invaders and they are not bad people, no matter what the President says. Today was the Panadería y Restaurante Salvadoreña on WT Harris, where I went with my 13 year old daughter. We had cheese pupusas and tamales de elote, which are corn tamales with a cheese dip. It was a lot of food because the pupusas were big (and a plate comes with three). They come with a big bowl of curtido--a tasty Salvarodan slaw--and salsa. We enjoyed it all and were really full. Well, one of us decided she had some room, since the front has a bakery and my daughter stopped to get a cookie. Note: for reasons unknown to me at least, this place is famous for being slow. And it is. Everyone was really friendly*, but lunch took a while. Since I knew that ahead of time, it was no big deal. But it might not be the best choice if you're in a hurry. * FYI, I ordered in Spanish, but my impression is that you could get it figured out in English. Definitely give it a try. My last review was just a few days ago, actually. Funny thing is, at that time we planned to go here, but it was closed on a Tuesday. Bloomberg has the scoop of a failed coup attempt in Venezuela. High level military officials were involved in the plot, which was discovered and squashed. The plot, code-named Operation Constitution, involved scores of captains, colonels, and generals from all four branches of Venezuela’s armed forces. The goal was straightforward and seismic—to capture President Nicolás Maduro and put him on trial. The plotters, wearing blue armbands marked OC, were supposed to storm the presidential palace and main military base and stop the May 20 presidential election. Some of the planning took place in Bogotá, but Colombian and U.S. officials, who allegedly knew about the plot and winked from the sidelines, declined to provide active support. Then something went wrong. In mid-May, several dozen servicemen, including one woman, as well as a couple of civilians, were secretly arrested—some have been accused of treason—and imprisoned by a military court. Many say they’ve been tortured. From the outside, this is hard to evaluate. It could mean Maduro has strengthened his hold on the military. On the other hand, there was an abortive coup in June 1973 in Chile before the one that worked. We just have no way of knowing what lessons other potential coup plotters have taken from this situation. But this is where the future lies. In both Nicaragua and Venezuela, unpopular governments are facing intense pressures that they can withstand because they have the military as a backbone. Once that is gone, so are they. I told myself I wouldn't comment more on Mike Pence but he is leaving a trail of absurdity that I am having a difficult time ignoring. He lectured Central American presidents on immigration. WTF? Everyone knows the damned trip is hard. Do you think prospective migrants don't know that? Everyone talks about it. Organized crime is involved. That's no secret either. And does anyone actually believe that potential migrants will change their decision because their president asks them to please refrain so that U.S. feelings are not hurt? Either they feel in danger or they don't. If they do, they're leaving no matter what any president or vice president says. And finally, the United States respects the sovereignty of Central American countries only when it's in its interests to do so. It violates that sovereignty with some regularity. This whole exercise is both futile and insulting, a condescending lecture that has countless before it in the sordid history of U.S.-Latin American relations. "Back in our country we face a crisis on our southern border as many seek to come into America for a better life," Pence said. "The families that Karen and I met today who have fled from Venezuela came here to Brazil not to seek a better life; they came here to live, to survive. And the families we spoke to today told us again and again how you desire to return to Venezuela and restore freedom in your land." Somehow, immigrants in the United States are not trying to "live" or "survive." "So I think there is a clear distinction between people in Central America who make an often dangerous journey attempting to enter our country and the people who are literally fleeing from Venezuela to survive," he said. We know very well that thousands of Latin American migrants are fleeing to survive. The United Nations has documented it. Human Right Watch has documented it. Amnesty International has documented it. (Sarah Bermeo also has a nice blog post on the non-economic reasons for emigration from Central America). There is no distinction to make. The conditions in Venezuela and, say, Honduras are not exactly the same. But in both cases, individuals and families are making the wrenching decision that they are no longer safe in their country. Jobs are scarce and violence is high. They are all trying to live and survive, and feel they cannot do so at home. The latest in an occasional food installment I started recently, really intended to highlight Latin American restaurants in Charlotte, which incidentally are small American businesses owned and operated by the same immigrants that the President of the United States demonizes as animals, invaders, and rapists. My 13 year old daughter and I went for dinner at El Pulgarcito de America, a Salvadoran restaurant on Central Avenue (though the menu also has Honduran and Mexican options). I had a combination of tamales and pupusa, which was great. My daughter got seafood soup, which turned out to be an enormous bowl overflowing with all kinds of seafood, including crab on top (with a crab cracker on the side of the plate) and rice on the side. She loved it (and for the first time in her life, ate a small squid) while I happily ate what she couldn't finish. The last place I went was Arepas Grill and I already want to get back there. Omar Encarnación has a thought provoking article in Foreign Policy about the escrache, an Argentine term that is a form of Latin American political theater intended to shame public officials. It tends to happen when people feel those officials are not being held accountable. He uses examples from Latin America to show how it can prompt positive political change. Still, there ought to be a place, in the repertoire of strategies to defend liberal democracy, for shaming and shunning those who implement illiberal policies. This is the point being made by those on the left, such as Democratic Rep. Maxine Waters of California, when defending the right of ordinary Americans to shame their public officials, especially when the policies being implemented are egregiously immoral and when the person atop of the government has so little concern for human rights. After all, the Trump administration’s retreat from the policy on separating immigrant families late last week came only after broad disapproval from the public, condemnation by the media of the policy as cruel and inhumane, and comparisons by historians with some of the ugliest episodes in U.S. history, such as the internment of Japanese-Americans during World War II. For an administration that hates to lose, this retreat was a rare concession to decency and human rights, and it’s the loudest protesters who deserve the greatest credit. There are several things to untangle here. First, we cannot be certain about the causality of the actions. In the most prominent case, it was used in Argentina in the 1990s to protest immunity for the dictatorship. That didn't get changed for many years and it's hard to make a case that the shaming played a significant role (others will know more about this and so feel free to point out any error here). I don't think Sarah Sanders' treatment at a restaurant is going to move the needle. (BTW, for an interesting take on public shaming of controversial administration officials, see this story about the decision not to shame H.R. Haldeman when in 1974 he took his daughter to Chez Panisse, a famous restaurant in Berkeley). There are other, and in fact more effective, ways to fight back against human rights abuses rather than being abusive yourself. Second, I wonder about the coarsening of public discourse more generally. My gut reaction is always against the "they do it, so should we" argument. Donald Trump uses disgusting and hateful language, but that doesn't mean I should. I am not at all sure it pushes us closer to our goals, one of which now is to protect the rights of immigrants. There's a little too much schadenfreude here for my taste as well--we may not be achieving our goals, but it sure feels good just to go off on someone. As Michelle Obama said, those who disagree with Trump should go high: "when someone is cruel or acts like a bully, you don't stoop to their level." This morning was on WFAE's Charlotte talks to discuss immigration at a national level (you can listen here). Thanks to Michael Bitzer at Catawba College for doing a good job guest hosting. It's always hard to get at details when you have less than an hour, but I think we did a pretty good job of providing the context and even historical background you need to understand the current situation. If we can bust the soundbite beliefs people have even a little bit, we're doing our jobs. It is a difficult time to be even somewhat knowledgeable about Latin American immigration to the United States. The number of myths and falsehoods is exponentially greater than at any time I can remember. I feel most frustrated when the national conversation is driven in large part by beliefs that immigration can be understood in episodic rather than structural terms. I co-authored a book in 2010 on the importance of demography for understanding how Latin American immigration works. I won't rehash that (and of course demography has continued its eternal evolution since then) but it's a reminder that structural forces matter a lot. History matters a lot too. In the book, we did not spend much time on the history of US-Latin American relations, for example. Joseph Nevins, a geographer at Vassar who has published a lot on immigration, has a post about the impact of decades of U.S. policy toward Honduras. The U.S. response to the 2009 coup had a powerful impact on emigration, which sped up as a result of the chaos the coup and aftermath unleashed, both politically and economically. These are push factors, which were present for many years but the Obama administration made them worse, though not through immigration policy per se. The same is true of the Reagan administration's funding of war in El Salvador. Both of those policies were based on ideology. Thus, the arguments now about why Hondurans (or indeed other Central Americans) are coming are almost all false. They are not coming because they want to exploit loopholes. DACA didn't make them come. Attacking families will not serve as a deterrent. And certainly their stories of sadness and grief are not fake. But when the President of the United States and other top officials repeat false claims on a daily basis, people who see themselves as rational and reasonable start believing them too. Leonardo Padura's Havana Gold is part of the "Havana Quartet," four novels about Police Lt. Mario Conde. As mysteries go, it's not particularly intricate or surprising, but he's a compelling character, lonely and introspective. The story is about the murder of a young teacher, who taught at the school he attended, which then brings up additional memories and regrets. Beyond the imagery of Havana and his own musings, I liked the indirect but clear political references. It was written in 1989, the same year Fidel Castro executed a high level military officer and hero, General Arnaldo Ochoa, who stood accused of drug trafficking. In the novel, the young woman's body is found at an apartment with remnants of marijuana, the presence of which surprised and vexed everyone. The vexation stemmed from the fact that whoever dealt drugs had ties to (unnamed) higher ups. Such things could not be done without them knowing. President Trump's executive order says not to separate families. He also refuses to hire more judges, but the big problem is that there are not enough resources to house people and to hear all the adult cases in anything remotely like a timely manner, and certainly not quickly enough before the children must be released. There is already a court case on the books saying children cannot be held indefinitely. Customs and Border Protection officials forcefully argued that agents who are apprehending migrant families at the border cannot refer all of the adults for prosecution because the Justice Department and other law enforcement agencies do not have the resources to process each case. Either you hire a crapton (to quote my teenage daughter) of judges or you let the families go. That's why CBP is saying it's not possible. Backlog has been a serious problem for many years and arresting more people means it is getting exponentially worse. Back in 2010 I wrote about how horrible the backlog was at 261,000 cases. Now it is 714,000. The system literally cannot handle the enforcement. The family separation crisis has been confusing, mostly because the Trump administration contradicted itself on a daily basis. Here is a quick and dirty chronology. --Clinton administration on separating families: no explicit policy. Signed the Immigration Reform and Immigrant Responsibility Act, which did not mention the issue. It was not common for families to arrive together at that time. It did open the door for more deportations, and thus deportations of parents. However, every so often separation did happen. Starting in 1993 there was a court case, Reno vs. Flores, where the Supreme Court ruled that children immigrants should be released to family as quickly as possible because of the treatment of a 15 year old Salvadoran girl. --Bush administration on separating families: created Operation Streamline in 2005 with the phrase "zero tolerance." The idea was to criminalize border crossers. Over time, the federal immigration system could not handle the numbers, and people were often released. As with the Clinton years, parents with children was not common. --Obama administration on separating families: continued Operation Streamline. When the surge of children occurred in 2014, many of them were unaccompanied, but when there were families they were locked up together. The number of families increased. as did the number of people released. Few families were separated and none were separated as a matter of policy. But the idea of family imprisonment became a real and troubling thing. --Trump daily during campaign: I hate immigrants and I like leading chants for people who hate immigrants. --Trump in August 2016 speech: my immigration policy will be zero tolerance. --Attorney General Jeff Sessions in April 2018: we will separate families. --Stephen Miller in June 2018: We have a zero tolerance policy. No one is "immune." --Trump: Family separation is a policy created by Democrats and they have to change that law for the policy to change. --Attorney General Jeff Sessions says it is the administration's policy and the Bible supports it. --Homeland Security Secretary Kirstjen Nielsen says there is no policy of family separation. --Nielsen says she will not apologize for the policy, which she had just said was not a policy. --Trump says the issue cannot be resolved through an executive order. --Trump then issues an executive order saying that families should be imprisoned together, even indefinitely. --Congress: we would pass a law of some sort if we were capable, but it's unclear whether we are. --Border Patrol official: we're not going to prosecute parents who cross the border with children until there are more resources. Department of Justice says that is not true. --Trump to Congress: stop trying to pass immigration legislation. You want to know what hyperinflation looks like? In Venezuela, Nicolás Maduro raised the minimum wage by two million bolívars. It was one million and now it is three million. Food vouchers went up from 1,555,500 to 2,196,000. Pensions went up 3,000,000. If you are wondering, 3,000,000 bolívars is $1.14 at the black market rate. The National Assembly, of course made up of the opposition, believes the inflation rate to be 24,600%. This crazily high number seems reasonable when a president is throwing around millions of the currency in an effort to keep up with the increases in prices. Tarek El Aissami has decided that another way is to send the army to check prices. Soldiers with rifles stand at the markets. Remember five years ago when it was 49.4%? That seemed pretty damned bad. Now it is literally more profitable to make purses out of money than to use the money itself. Go check out Steven Hyland interviewing Steven Taylor on SECOLAS' Historias podcast. Among many other things, he talks about the Colombian left and offers a less optimistic view than I did. And there's the question of how independent Iván Duque will be from Alvaro Uribe. And of course there's Venezuela. Late last week there was at least some hope that dialogue in Nicaragua could show some progress. In particular, the two sides were talking about finding international mediators. The opposition wants the Inter-American Commission on Human Rights, the UN High Commissioner for Human Rights, and the European Union. They thought they had agreement, but when they asked the government to show the invitations, there weren't any. The Foreign Minister said there were "bureaucratic" reasons they weren't sent. After reneging, Rosario Murillo said she wanted peace and reconciliation. She also said there were "malignant spirits" in Nicaragua and everyone needed to believe in Jesus Christ. She made clear that she wants everyone's spirits to be "full of light." Apparently international mediators are not full of light because they aren't being allowed in. This story is starting to sound familiar. Fraudulent elections, opposition protests, splintered opposition, attempt at dialogue, failure at dialogue. I assume U.S. sanctions are not fall behind. Increasingly in Nicaragua, just as in Venezuela, the big question is how long the government can keep the army on its side. However, I think one difference is how much more intense the anti-government actions are. Protesters are blocking large chunks of Managua, though elsewhere as well. 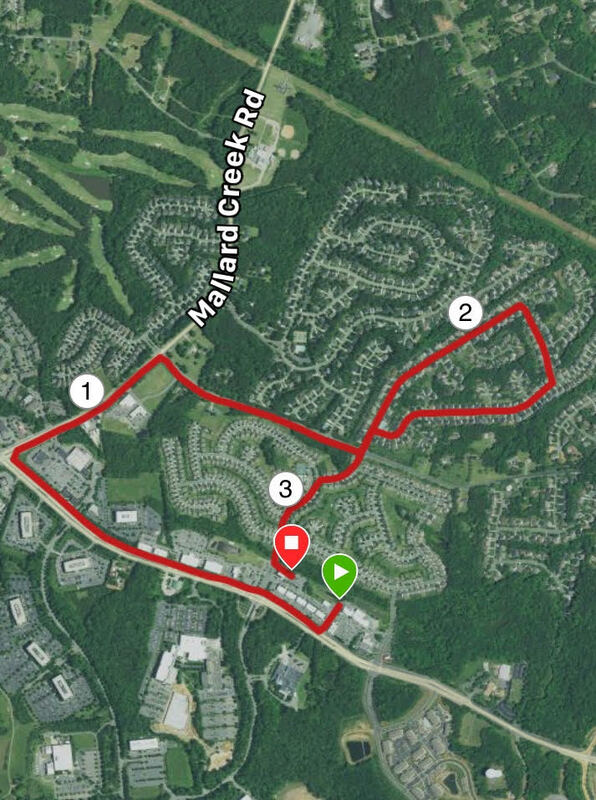 It's at the point where you can go online for updated maps on where the tranques are. My sense is that there is more intense domestic pressure on Daniel Ortega than on Nicolás Maduro. At the same time, there have been periods of such pressure in Venezuela and the opposition could not keep it up as the government simply dug in and waited them out. If you haven't already, listen to the podcast I did with Christine Wade last Friday on the crisis. The UN High Commissioner on Refugees just published a "situational update" on Venezuela. This is a catastrophe of frightening magnitude and it is affecting every country in the entire hemisphere. 1.5 million people and the majority are undocumented. More than 340.000 Venezuelans have entered Ecuador since the beginning of 2018 (compared to 287,000 arrivals registered for the whole 2017). In Brazil, 527 Venezuelan nationals had been relocated from border regions to Brazilian cities in the country (Cuiabá, Manaus and São Paulo). 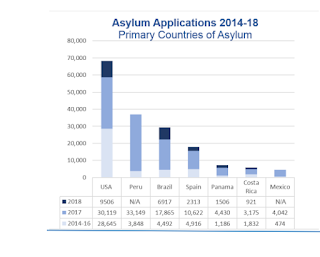 The number of Venezuelans seeking asylum has risen yearly. 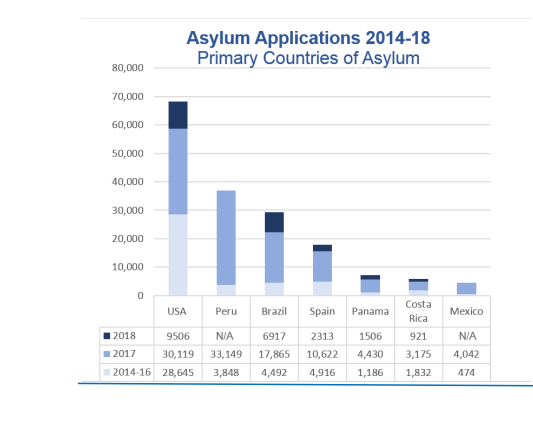 Between 2014 and 2018, some 185,783 asylum claims have been lodged. More than 1.5 million Venezuelans have moved into neighbouring countries. While some of them have obtained documentation which allows them to stay legally, the majority of Venezuelans who have left their country have no regular status, and are therefore more vulnerable to any form of exploitation, abuse, violence, trafficking and discrimination. Just remember too. If you squeeze the country with sanctions, you are directly contributing to this crisis. Iván Duque defeated Gustavo Petro in the Colombian runoff election yesterday, 54%-42%. Boz has some good points about the outcome, including the importance of centrists. Adam Isacson also has a post worth your time on how this affects the peace agreement. I'd like to chime in on the broader view. It will be tempting to view this as part of an overall conservative wave in Latin America, and I fully expect that kind of assertion to spread, especially since this was a clear cut contest between candidates who self-identified as left and right. It has already started, really. But that is misleading and does not pay sufficient attention to the specific Colombian context. The FARC effectively prevented any real political left from developing in Colombia. It was too hard for the left to convince people it wasn't going to be soft on the FARC, or even tied to it. Look back at 2010, when Antanas Mockus ran and won only 27.5% in a runoff after being clobbered in the first round. It was just too easy to tie the left to the FARC, to Hugo Chávez, to Fidel Castro. Etc. Petro was openly struggling against this. And the fact that he got 42% of the vote means he succeeded far more than anyone else in the past. Not enough to win, obviously, but enough to breath life into the aspirations of the left. It's fair to say that it won't be long before a leftist can win the presidency, and that's something that just has not been true before. The Trump administration is separating children from their parents when they are apprehended, a practice considered too harsh and horrible by previous administrations. There has been considerable public response and the administration's stance is indicative of dysfunction and deceit. President Trump blames congressional Democrats. His logic is the same as hostage taking. Kidnap someone and demand ransom. If the ransom is not paid, you hurt the hostage and blame the side that would not give you money. The real answer is that the hostage never should have been taken in the first place. You do not need a law or any reform to end it. He can do so right this second. But it gets worse. Attorney General Jess Sessions contradicted Trump by taking full ownership over separating families and saying the Bible defends the practice. White House advisor Stephen Miller also contradicted Trump and took ownership, saying it was a "simple decision." They happily label it as deterrence--treat people so inhumanely that word will get out and people will stop emigrating. As Steve Bannon says, it is a conscious zero tolerance policy that needs no justification. For xenophobes, it is simply common sense--hurting brown-skinned foreigners is good. Melania Trump weighed in, saying through a spokesperson that she "hates" the practice and calling immigration reform, echoing the inaccurate assertion that you need a new law to end it. But one of the truly craziest responses was Department of Homeland Security Secretary Kirstjen Nielsen, who said it's not a policy at all. High level administration officials have already said it is a policy and the increase of the practice has been very public. And that's where we are in 2018. Update: the president of the American Academy of Pediatrics labeled it as "child abuse." New Update: Not long after I posted this, President Trump and other administration officials changed the story a bit, saying that the parents were fake and were in fact criminals posing as parents. 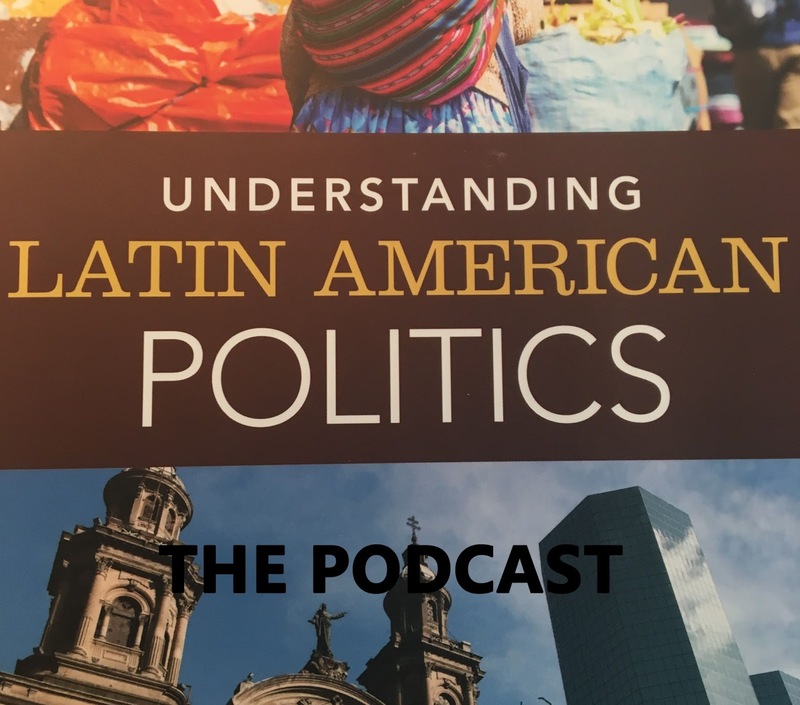 In Episode 54 of Understanding Latin American Politics: The Podcast, I talk with Christine Wade, who is Professor of Political Science and International Studies at Washington College. She studies Central America and recently published Captured Peace: Elites and Peacebuilding in El Salvador and also the ninth edition of Latin American Politics and Development. We discuss the Nicaraguan crisis. FYI, she mentions an article that just came out at NACLA that she recommended: here is the link. Among other things, we talk about the diffuse nature of the opposition, what's up with security forces, and how much this is all affecting the average Nicaraguan. In the last quarter century all three economies have evolved in important ways. Hence, the Trump administration’s determination to force improvements on our partners is not unreasonable. The Trump administration’s goal is a better deal for U.S. workers and industry. Trump is not necessarily wrong when he asserts that much of the world has ridden our coattails to an era of greater prosperity. We would be wrong, however, to ignore the corollary to that assertion: the U.S. has – in the aggregate – become more prosperous as well. The aim of the current negotiations should be to create a better trading regime, one that eliminates distortions without sacrificing benefits. "Forcing improvements on our partners" means a trade war. It's not clear to me how we can consider that reasonable. And the whole "ridden our coattails" thing is simplistic and implies unreasonably that we are "owed." The United States has benefited massively from the post-World War II economic order. There's no way around that. The piece seems aimed at the NC congressional delegation but the combined praise of NAFTA and Trump makes it difficult to see precisely what he's advocating. I am excited to announce that starting January 1, 2019 The Latin Americanist will be published by the University of North Carolina Press. It's a perfect fit, especially since the Southeastern Council of Latin American Studies, which owns the journal, is a southern-oriented organization. And it's great to be working with an academic press. If you have a manuscript, you should consider us! You see periodic efforts to defend the integrity of elections in Venezuela. John Polga-Hecimovich takes aim at one and breathes fire at it. Venezuela is a dictatorship whose economic problems are the result of irresponsible policymaking. The more Mr. Kovalik and others see conspiracies where there are none, the more they allow themselves to become apologists for a dictator. I assume his essay will be dismissed as the work of an imperialist pawn. BTW, see Geoff Ramsey's post just prior to the election as well. Defenders of the election tend to skirt past most of the substance. Reading Tim Wendel's Summer of '68: The Season That Changed Baseball, and America, Forever is a reminder that our current era has parallels for awfulness. The book is the story of a year, but it tends to focus a lot on the Tigers and on the World Series they played (and won) against the Cardinals. Wendel doesn't really come to any particular conclusions--he weaves some different sports in though they don't form part of a broader narrative. The Tigers are an appropriate subject because their run for the championship helped unite the city to an extent, which has experienced riots the year prior. Baseball didn't fix or heal racial divides, but even the players themselves--black or white--felt like they were truly playing for their city. They were misfits, not smooth and athletic like the Cardinals. If there is any theme, it's that the "real world" touches on and draws from baseball whether the players know it or not. Politicians from both parties wanted to comment on or attend games. Martin Luther King Jr. was not a sports fan per se but of course understood how race relations in major sports impacted public policy. Football was only just taking off at that point, and it's interested how it has overtaken baseball in terms of political importance. Donald Trump is whining about the NFL and to an extent the NBA, but not MLB. An important contribution of the book is that for the first time it highlights the countless ways women on both sides of the conflict were central to it. For better or worse, the war could not have been waged without them. Women were taking care of business at home, traveling with armies, opening businesses, and working in factories (especially textiles). They were also writing stories, plays, and music. War changed gender roles, though Belohlavek is careful to explain that such transformations were not drastic. Yet the war represented “an incremental step toward advancing greater gender awareness and promoting female involvement within the Mexican and American societies” (243). He succeeded in that effort. Historical studies of U.S.-Latin American relations would benefit from more of this understanding. If you like histories of U.S.-Latin American relations, you might want to check it out. Women don't tend to have much of a role in those histories so it's a refreshing look. I was interviewed for Spectrum, a local TV news station, about Latino turnout in last month's primary election. The upshot is that registration and turnout jumped in Mecklenburg County (where Charlotte is). 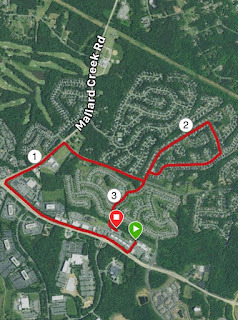 It's still small, but moving upward. As of today, according to the North Carolina Board of Elections 4.2% of all voters in Mecklenburg County are Latino versus 3.8% for the 2016 presidential election. Meanwhile, as of today 2.7% of NC voters are Latino. Mecklenburg County is more urban and votes more Democratic, which makes it more likely to have a greater share of Latino voters. Both the party itself and independent activists have made strides to register voters and get them to the polls. In NC as a whole, 29% of the Latino population is registered, whereas it is 32% in Mecklenburg County. So this cohort is still a "sleeping giant" but some important advances have been made. High abstention rates, which included Chavistas, weaken Nicolás Maduro, but do not stop him. The opposition needs to get its act together, and unanimity about election fraud could (finally!) provide a first step. At least from what we can see, things have ground to a halt. At this point, the biggest danger to the government is a united opposition. This is more important than sanctions or regional response. One continuing problem is actually uniting around fraud--Henri Falcon called foul on elections but now is asking for...more elections. That is sure to keep the opposition fractured for the time being.